My new XPS 12 is a pretty nice machine. Small (0.8” × 12.5” × 8.5”) and light (3.35 lbs), despite the intricacies of the flip screen and the touch capability. The top and bottom are covered in some kind of black matt surface that’s easy to grip and doesn’t seem to mark that easily. Yet, I’d prefer having something to protect it. Unfortunately it’s not such a bestseller like, say, the 13” MacBook Air that a whole accessories industry has grown around it. 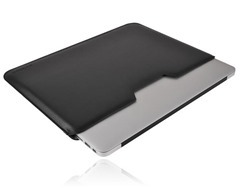 Dell sell a couple of cases (too big and unwieldy for an ultrabook like this in my view), and a sleeve at $45. The sleeve at least has a flap with magnetic clasp, but is a smidge expensive. My wife has an XPS 13 for which I purchased a Speck TrimSleeve. This was ostensibly for a 13” MacBook Air (the two machines have very similar dimensions). The XPS 12 fits in it nicely: what it gains in height, it loses in width and depth and so just glides into the sleeve. Unfortunately it seems Speck don’t sell it any more: (a) it’s out of stock, and (b) you can’t even get to the product page from the home page. This is a shame since it works extremely well and is pretty stylish too. Since this mini-experiment showed that a 13” MacBook Air sleeve would be ideal, I did some research and found the Slim Sleeve from Incipio at $30. It looks to be very well made and classy. There are eight possible colors, but I wimped out and got black. It was delivered today, and I’m glad to say the XPS 12 fits it just right. The only issue is that the device could slip out since there’s no flap or clasp to hold it in, but I can’t see that as being a problem with the way I use the machine. We’ll see. Just got an XPS 12 a few weeks back and am looking for a nice low profile sleeve for it. Did you get that sleeve from Incipio? What are your thoughts about it (assuming you have used it for a while)? Aaron: The Incipio sleeve works just great. The XPS 12 is my main travel machine (my other laptop is too heavy to carry around too much), and the sleeve has been ideal. The only (minor) niggle is that there's no latch or clasp to keep the machine inside, but in the 8 months I've had it, it's never slipped out by accident.